I heart pesto. Basil Pesto. Sundried Tomato Pesto. Cilantro Pesto. 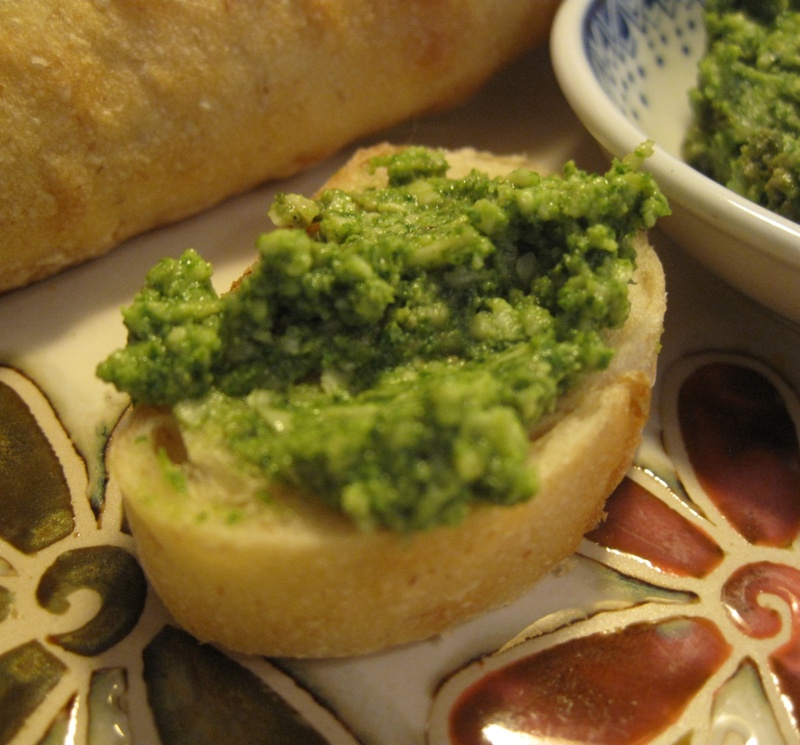 Spinach Pesto. If it’s green, garlicky and full of “heart healthy” fats, I’ll eat it. 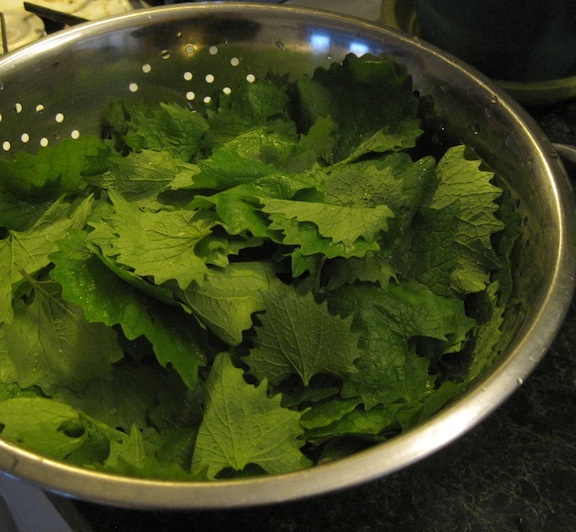 So imagine my geekish glee when I learned the incredibly invasive garlic mustard weed can be turned into pesto. It’s cliche but true: If you can’t beat ’em, eat ’em, and there is no sweeter revenge than pulling up pests and serving them up for dinner. I followed a recipe I found online, with a little variation: I substituted 1/2 of the olive oil for a ripe avocado and a splash of lemon juice.. The resulting flavor was lightly garlicky and creamy with a vibrant taste of… well for lack of a better word…. GREEN. And because the leaves are already garlicky, you don’t need to go overboard. 2 cloves were good for me. Use more if you’re afraid of vampires, less if you’d like to be kissed. 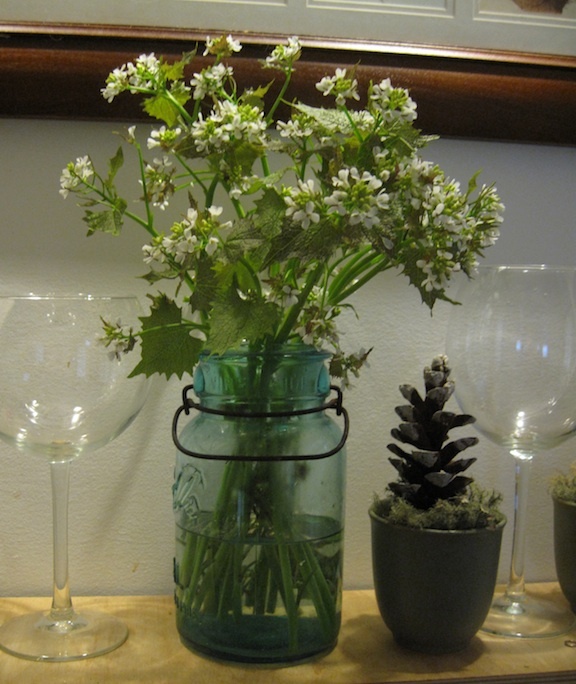 If you’re going to try this at home, be sure to identify the garlic mustard weed properly. This National Park Service web page can help you identify the plant. 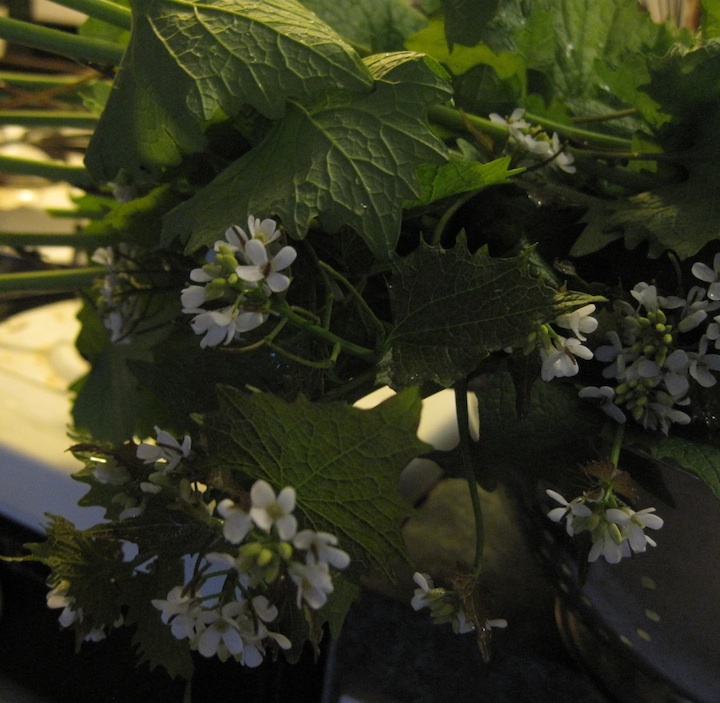 Garlic Mustard plants have one flowering stem full of white flowers with four separated petals. Leaves are alternate, triangular, with tooth shaped edges, and they smell distinctly like garlic when crushed. If you are NOT SURE you have identified this plant correctly, do not eat it. If you’re using the pesto for pasta, add a little reserved cooking water. Otherwise you can leave it out. I prefer to grind up the walnuts and garlic separately, then add them at the very end with the shredded cheese. It makes for a nice nutty texture. Notes: Original Source for the Recipe: Monches Farm, though I did alter it slightly. For the record, I looked at A LOT of recipes and chose this one because it was the closest to my favorite basil pesto recipe. Wild Man Steve Brill has an interesting recipe that uses the root of the plant too, but I was too lazy to try this. This will be my new go-to pesto when I can’t find basil. I’m on an edible weed kick lately so I’ll let you know when I find another keeper.